Siphiwe sits in the middle of a crowd of her friends and neighbors. They’re cheering for her. Applauding. It feels like the entire community is there. She watches in amazement as they roll a brand new wheelchair toward her, a gift after the local radio station raised money in her honor. She can hardly believe they would show her this kindness. This celebration all started with a box of food. It all started when BGR partners walked into her life. Siphiwe’s journey to this moment started with an accident. She had been paralyzed for more than a decade after surviving a car crash at the age of 42. The accident damaged her spine and left her bound to a wheelchair for the rest of her life. After so many years, her wheelchair was old and worn out. It was too big and didn’t have the right adaptations for a paraplegic, so it rubbed sores onto her body. But, Siphiwe had other concerns. After the crash, Siphiwe could no longer work at the company where she had served 19 years as a machinist. She couldn’t earn paychecks to keep her two sons fed and clothed. This once independent woman had to rely on her elderly mother for care—and her dignity was forgotten. Then, a food box paved the way for so many blessings. Not long ago, Siphiwe learned that BGR partners were distributing monthly food packets to people in her community. She knew regular food deliveries could be such a help to her struggling household. The woman got in touch with partners through her local church and asked to be added to the list. Sadly, she couldn’t pick up the food herself, so her 86-year-old mother hobbled to the distribution site. But, BGR partners couldn’t sit back and watch a frail woman pick up the heavy boxes herself. They began delivering food to Siphiwe’s house and met her family. They heard her story, and it weighed heavily on their hearts. So, partners gave the family a BGR hospice kit along with the monthly food parcels. Though neither woman needed hospice care, the kit contained wonders: lip balm, socks, latex gloves, sheets, body lotion, and more. These precious items were a blessing for both Siphiwe and her mother. These acts of love inspired the community to do something more. Siphiwe had already endured so much in her life, and BGR partners didn’t want her to continue living in pain. So, they shared her story with a local church, and it moved one church member to approach a local radio station for help. The station helped raise enough money to buy Siphiwe a new wheelchair and pressure cushion. The community couldn’t wait to present Siphiwe with this gift. God uses your gifts to create ripples of love around the world. When you send a food packet through the BGR Gift Catalog, you might open a door for meeting a wider set of needs. 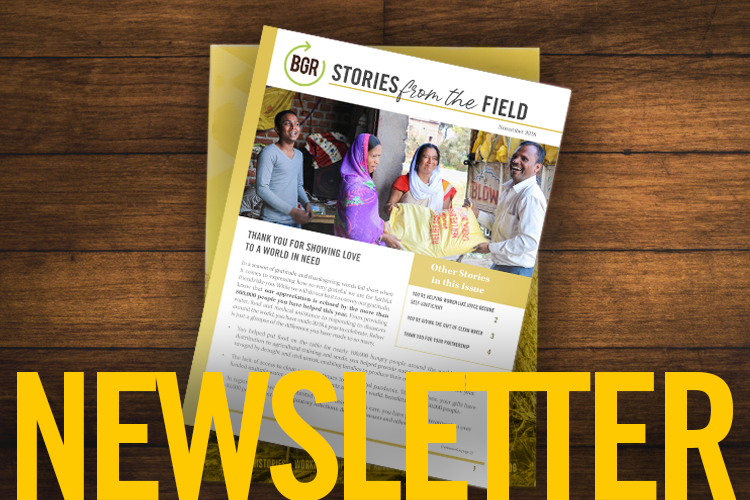 God could use that box of rice, cooking oil, or sugar to connect a BGR partner with an ailing widow or a struggling father who needs other help. And, the Lord might provide new opportunities to shower love upon the poor. Think about the other doors your gifts could open. Become a Response Partner today and see what miracles God can perform through your generosity.